Hello everyone! I am here switching it up a bit with a non-investing-related post inspired by an email I received from a member of the Girl$ on The Money community in regards to her credit/FICO score. I read an incredible article in the Wall Street Journal some time ago in reference to this same exact question. I learned so much from that article and felt the information should be shared. One of my resolutions for this coming year is to have healthier finances, starting with my credit score. Can you provide any tips on how I can go about doing this? Before I get into this question, I believe it would be valuable and interesting to start by sharing some of the cool stats in the WSJ article. How are other people doing? 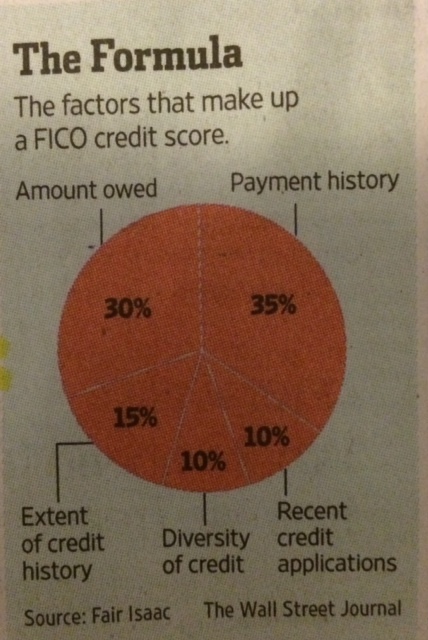 What is your FICO score composed of? 1. Via any of the three major credit reporting agencies: Experian, Equifax, Transunion. Costs can range anywhere from $14.95 to $21.95. Keep in mind that these agencies may be getting information from different sources so the final scores may differ slightly. If you see huge discrepancies, may be a good idea to look closely at the credit reports for incorrect information. 2. Lenders such as Citigroup will start showing FICO scores to customers with citi branded cars. Similar lenders such as Discover Financial Service and Barclays cards already offer this service free of charge. Check with your respective credit card companies to find out if they plan to offer this. Word to the Wise: Beware of firms who constantly run ads on TV or online offering a “free credit score”. There may be a huge discrepancy between your official FICO score and the scores these “free” online firms offer. Often times they offer a free score in exchange for your personal information which they can then turn around and sell to advertisers. A good rule of thumb to do your research before you provide any information to anyone. Especially via the Internet. And especially for a free service. “…paying your credit card bill in full when the statement arrives isn’t good enough if you want to keep your debt-to-limit ratio low, as the balances on your credit reports at Equifax, Experian, TransUnion are based on the most recent month’s credit card statement….one trick is to pay the lender soon after you use the credit card, well before the statement closing date”. 2. Even if you have multiple cards, try not to use no more than two credit cards at the time. Choose the two cards that have the highest spending limits. Stay away from store-branded credit cards (target, gap, etc.) which tend to have lower spending limits. 3. For a FICO score of 800 or more, look to have a debt to limit ratio of no more than 10%. Example: if your combined credit limit on all your credit cards is $20,000; try to use no more than $2,000 at any one time. 4. If your credit card company calls you offering a credit increase or if you contact them; ask whether they will be running your credit before granting the increase. If they do, that may have an effect on your score as well. You may want to pass on this one. 5. Although is good when your lenders increase your limits, refrain yourself from using the extra credit if your goal is to improve your credit score. 6. If you have multiple cards, focus on two of them (as previously noted), but try to use the other cards at least once a year. Some credit card companies may close your account if they don’t see any activity. Depending on how long you’ve had that particular card, a closing of that line of credit may hurt your score. 1. Information about a successful pay off of car loans and/or a mortgage may stay on your credit report for about 10 years. 2. However, information about missing a payment or defaulting on a loan may show on your credit report for up to 7 years. 3. If you are currently looking for best interest rates on your mortgages, car loans, student loans; try to complete all inquiries within a 30 day period. Inquiries aren’t factored into your FICO score within the first 30 days on file and are treated as one inquiry if they occur within a 45-day window. More spread out hits may begin to take an effect on your score. Hope this information was valuable to you. I personally learned new facts as I researched information for this post which I will be applying to my own financial life. And finally… if you are looking for a Facebook group that focuses entirely on credit and credit score questions and resources, check out The Creditnista’s – Netiva Heard “Credit Makes Sense: Prosperity Partners”. She’s awesome and extremely knowledgeable on this specific topic! Tell her Girl$ on The Money sent you :). *Note: This is not sponsored in any way. Netiva is truly awesome. Had to mention her in this article. TELL ME: Do you know your current FICO score? What was the most valuable tip to YOU in this article? Wishing you Health, Love, Success, and Profits! Already have your savings and credit on track and are ready to graduate into investing? Join the waiting list for the next edition of the Stock Market Investing Bootcamp for Beginners!